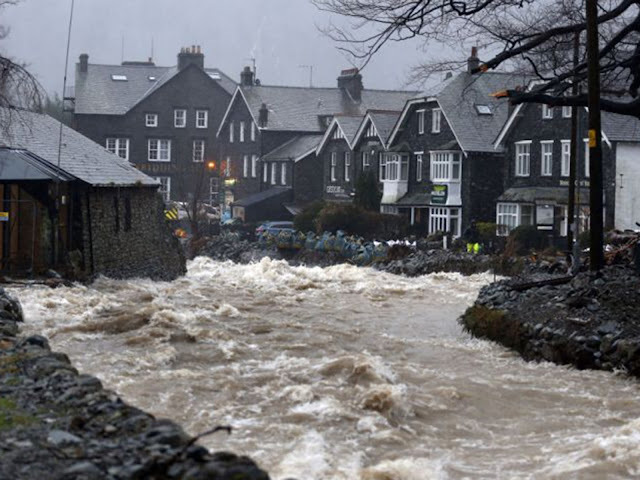 More flooding misery is expected for the UK toward the end of next week as the latest storm is expected to strike bringing torrential rain and possibly wind damage. Parts of the UK are set to be unseasonably warm in the next few days with temperatures set to be around 16C, 61F which is nearly double for the time of the year. Incoming cloud will trap warmth and deliver a 25C swing by Wednesday, a week after it was almost minus 10C. Odds on a white Christmas in London are currently at 10/1, the longest offered in five years. However another storm is expected to hit Northern Ireland and Scotland on Friday which could result in more flooding. An active storm track will set up across the United Kingdom during the end of next week resulting in an increased threat for wind storms and unfortunately more flooding. The last five winters have been devastating for parts of the UK as massive storms roll in from the Atlantic bringing torrential downpours, last winter saw the wettest December since records began for Scotland and Wales, the fourth-wettest for Northern Ireland and the second-wettest overall for the UK and this winter is shaping up to be just as bad. Warm, humid air carried by strong south-westerly winds influenced by the Atlantic jet stream is dumping huge volumes of rain onto Britain causing devastation to land and property and it looks like the Brit’s are going to have to get used to it!